Donato Renzetti is one of the most renowned Italian conductors in the world. He conducts both concerts and operas we well as recording discs. He was a prize-winner at the Diapason d’argento competition (1975), the Gino Marinuzzi Competition in San Remo and the Ottorino Respighi Competition at the Accademia Chigiana in Siena (1976). In 1978 he won the bronze medal at the I Ernst Ansermet Competition in Geneva and in 1980 he was the absolute winner at the X Guido Cantelli Competition at the Teatro alla Scala. Renzetti conducts some of most important orchestras in the world, among them the London Sinfonietta, the London Philharmonic, the London Philharmonia, the English Chamber Orchestra, the RIAS in Berlin, the Hungarian State Orchestra, the Tokyo Philharmonic, the Buenos Aires Philharmonic, the Orchestra of the Teatro alla Scala in Milan, the Orchestra of the Accademia di Santa Cecilia (Rome), the Dallas Symphony, the Belgian Radio and Television Orchestra in Brussels, the Orchestre National du Capitol de Toulouse, the Orchestre National de Lille, the Orchestre National de Lyon, the Zeeland Symphony Orchestra and the Orchestra della RAI in Milan, Turin and Rome. 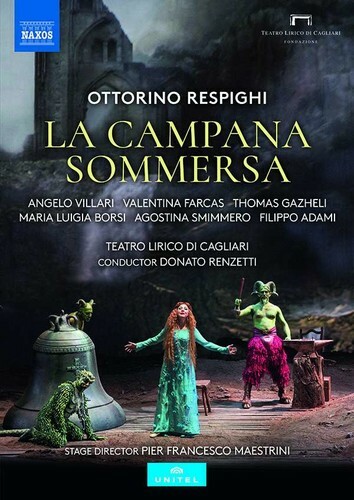 He has collaborated with such soloists as Salvatore Accardo, Lazar Berman, Mario Brunello, A. Bulin, Michele Campanella, Domenico Ceccarossi, Severino Gazzelloni, B.L. Gerberg, Nikita Magaloff, Antonio Meneses, Viktoria Mullova, Mstislav Rostropovich, Maria Tipo and Alexis Weissenberg; he has performed at the world’s great opera venues, among them the Opéra de Paris, Covent Garden in London, the Grand Théâtre de Genève, the Staatsoper in Munich, the Capitole de Toulouse, Carnegie Hall and the Metropolitan Opera in New York, the Lyric Opera of Chicago, the Dallas Opera, the San Francisco Opera, the Teatro Colón in Buenos Aires, the Bunka Theatre in Tokyo, the Megaron in Athens, the Teatro alla Scala in Milan and every major opera house in Italy. The conductor has been a guest at festivals in Glyndebourne, Spoleto and Pesaro as well as the Verdi Festival in Parma. In 1987 he conducted the opera Aida with Arena di Verona in Luxor (Egypt). From 1982 to 1987 he was Principal Conductor of the Orchestra Internazionale d’Italia, from 1987 to 1992 he was Principal Conductor of the Orchestra Regionale Toscana, from 1993 to 2001 he was Principal Conductor of the Orchestra Stabile di Bergamo and from 2004 to 2007 he was Principal Guest Conductor of the Portuguese Symphony Orchestra. In 2007 he was appointed Artistic Director and Principal Director of the Orchestra Filarmonica Marchigiana. The conductor’s discography includes numerous recordings of music by Mozart, Tchaikovsky, Simon Mayr and Cherubini on the Philips, Frequenz, Fonit Cetra, Nuova Era and Dynamic labels; he also recorded the previously unperformed Overture by Schubert. His opera recordings include Attila, Il signor Bruschino, L cambiale di matrimonio and La Favorite; on DVD he has recorded La Fille du régiment at the Teatro alla Scala, La Cenerentola at the Glyndebourne Festival, La Gioconda at the Arena di Verona and L’italiana in Algeri at the Pesaro Festival. His recording of Schumann’s Manfred with the Orchestra and Chorus of the Teatro alla Scala won the XIX Premio della Critica Discografica Italiana. Since 1987 he has been a teacher of conducting at the Corso Triennale di Alto Perfezionamento at the Accademia Musicale Pescarese. In 2002 the Regione Abruzzo conferred upon him the Premio Frentano d’Oro for the merit he has earned in Italy and abroad. The Associazione Amici della Lirica of the Rossini Opera Festival in Pesaro honoured him with the Premio Rossini d’Oro in 2006.